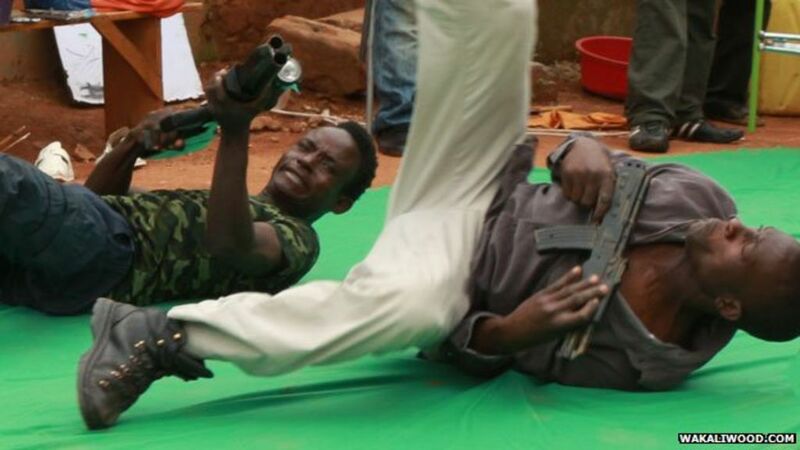 billed as Uganda's first action movie. Image copyright Wakaliwood.com Image caption The replica of Rambo's machine gun, welded from scrap metalThe clip had an electrifying effect on Hofmanis. Image copyright Wakaliwood.com Image caption Children do kung fu poses in front of posters advertising the next Wakaliwood filmSewage plays a part in all of Nabwana's movies. Image copyright Wakaliwood.com Image caption The design for a spinning gun, inspired by the film PredatorThe team spend a lot of time discussing weapons. And they are inviting fans from around the world to submit scenes for "the world's first crowd-sourced action film" - called Tebaatusasula: EBOLA.